Braid is now available in the Ubuntu Software Center. Thanks to Jonathan Beilin for doing the necessary legwork for the game to go up there (and of course to Ryan C Gordon for doing the port). Ubuntu 11.10 notes: please ensure that you are using drivers that enable 3D acceleration. This may involve using the ‘additional’ (proprietary) drivers listed in the ‘System’ pane. Set your volume before you start the game â€“ you may not be able to use volume hotkeys on your keyboard to adjust the volume once the game is active. You may see a black window while the game is starting. The first launch is the longest. Also of note is a list of command line switches. Thanks to Ryan C. Gordon for doing the Linux port! The Chaparral High School Alumni Theatre’s production of Braid: A Movement Piece during the summer of 2010. Using a unique combination of content movement and contact improvisation dance techniques, Braid follows the story of young scientist Tim on his quest to find a Princess. 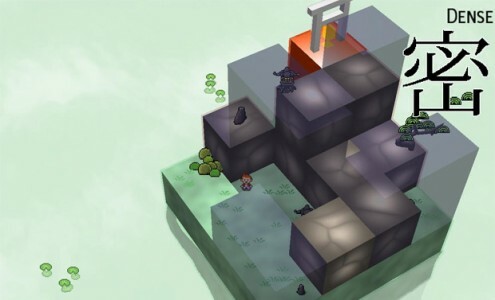 Miegakure, by Marc ten Bosch, is a puzzle game where you travel through four-dimensional space (and manipulate objects in that space). I was privileged to play an early version in 2009; just this week I got to play the most recent version, and it is coming along tremendously. It is my Game of the Year, though it is unlikely to be released this year. I find it easy to think of Miegakure as one of the great puzzle games of all time. If I can be said to have an agenda in game design, it has something to do with mind-expansion. Â Because of that, I very much appreciate it when other designers make games with that kind of intention. Â Games that are truly mind-expanding are very rare and very difficult to make, but this is one of them. Keep an eye out for this game, and when it comes out, play it. Â Since it will be a while before release, so there’s no demo available. Here’s an introduction to the game. Here’s an interview Marc did with Gamasutra with further details. To keep up with news on the game, you can subscribe to Marc’s blog. This was cross-posted from the development blog for The Witness. Earlier this year, some friends and I, all successful independent game developers, put together the Indie Fund in order to help support newer folks with good ideas. All the hoops involved in setting up such an organization have been passed through, and we are now open for general submissions. If you are an independent developer who needs money for a project-in-progress, go check out the Apply page to see what kinds of games we are looking for. This game is very good. You should play it now. There’s a free demo you can get from the publisher’s site or from Steam. You might have an impulse to skip this game because of the name, or because it looks like number puzzles. It is number puzzles, and the game does a very refreshing job of exploring that design space. You’ll be surprised many times before you are done playing. It is a joyful game to play. The idea of thoroughly exploring a design space has come up in conversation a lot lately. Last week, Chris Hecker gave a rant on this topic, titled “Please Finish Your Game”. The ability to explore a space like this is a very, very valuable skill for a game designer to have. From the look of the games being produced currently, it seems that not many designers know how to do it. The best way to learn it is by example, and this game is a very good example. I learned a lot of interesting things from SquareLogic. Today we are announcing a fund that provides very good terms for talented indie developers working on high-quality games. Â Our terms are much friendlier than what publishers offer. Â Our goal is to help indies become stronger while retaining their independence. The past couple of years have been good for independent game developers. Â Through download services like Xbox Live Arcade, the PlayStation Network, WiiWare, and Steam, independent developers have found a very large audience. Â Some of us have been lucky enough to develop hit indie games that were very financially successful. Braid was one of those games. Â The success of Braid has allowed me to undertake more-ambitious projects like The Witness. Â At the same time, I felt that I wanted to do something with the profits that would help other indies with their own games. Â More recently, while talking to publishers about The Witness, I felt that the business climate around publishing and funding these smaller games had not caught up with reality: it’s a model where the standard terms are tuned for budgets in the tens of millions of dollars. Â Because publishers want to stick to this model even for low-budget games, it was very hard for indie developers to get a fair deal. It turns out that other successful indies felt the same way, so we have pooled our resources and launched this fund. Â We will be announcing further details soon. Â At the GDC, Ron Carmel will be giving a talk about the problems that exist in the current publishing model for indie-budget games. We’ve had the timing of this announcement planned for a while, but it seems like some kind of strange synchronicity that we’re revealing our existenceÂ just as all this trouble is happening at Infinity Ward. Â When you’re a mainstream developer, and you’ve made one of the most successful and profitable games of all time, and then just a few months later your publisher and parent company is willing to so bald-facedly mutilate your company, well, what conclusions can be drawn from that? Â If publishers of that size are so megalomaniacal as to be incapable of seeing the importance of a developer’s talent — instead believing that the game’s success is somehow due primarily to their brilliant marketing strategy or their CEO’s charming personality — then how will this ever change? If Infinity Ward can’t be treated with respect, then who can? Independent developers can. Â That’s one answer, at least. Â Indie Fund is here to help make that independent existence a reality for as many talented developers as we can. Here’s a link to the main Indie Fund site, with an email you can use to contact us. Experimental Gameplay GDC session cancelled. We’ve posted an explanation on the site, along with details about the future. It’s a little bit sad, as this is the first time in 10 years we haven’t done it, but it’s all good! The Witness now has a development blog. We’ve created a development blog for The Witness, the new game being designed by Jonathan Blow. Here’s the link to the front page of the site, and here’s a direct link to the blog. Not much information about the game has been made public yet. Well… here is some. More to come!